Martin started his career at Leeds United, but failed to break into the first team squad. He went out on loan to Blackpool for some first team experience, but eventually left in 1998 and joined Scottish side Morton. He failed to settle in Scotland and after a loan spell at Doncaster Rovers, joined them in the summer of 1999. Again, appearances were limited, and he went out on loan to Ilkeston Town during his time there. In 2001, Martin signed for Conference side Forest Green Rovers, where he spent three seasons, making over 130 appearances. In 2004, he joined Halifax Town, making almost 100 appearances for the Shaymen, before joining Oxford United on loan in January 2007. He signed for Diamonds from Halifax on 1 June 2007 on a one year contract, but left my mutual consent in January 2008, mainly due to the travelling time from his home and young family in Sheffield. 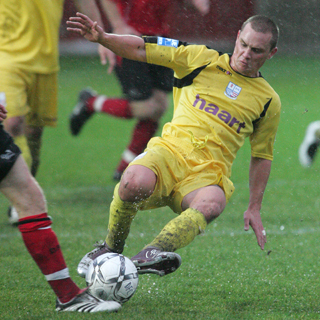 He left Diamonds to join Tamworth on 8 January 2008 and became their team captain for the 2008 / 2009 season. He joined newly promoted Conference North side Eastwood Town on 17 June 2009, but left on 10 December 2009 to join fellow Conference North side Harrogate Town. After retiring from playing he had a spell as joint-manager at Matlock Town from October 2014 until the start of 2015, before he became Assistant Manager with Gainsborough Trinity in 2016. He left that role in February 2017. His Wikipedia page is here.